The clinical studies included in this section attest to both the safety and effectiveness of Siliphos®, the active ingredient in UltraThistle®. Pharmacological and toxicological results, added to those found from pharmacokinetic studies, have provided the basis for clinical testing of SILIPHOS®. Clinical studies, here reported, have been performed to evaluate the properties of this new complex in subjects with "pathological" impairment of liver function. The results, including the optimal tolerability obtained in these "extreme" clinical situations, give strong support for the use of SILIPHOS® in those "non pathological" conditions mostly associated with the action of damaging agents on liver cells. Vailati et al.18 performed an open randomized trial on 65 patients suffering from chronic persistent hepatitis. 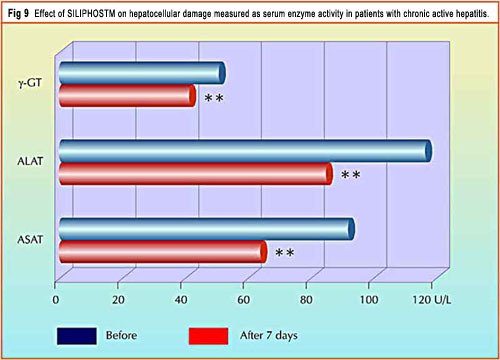 This chart shows the dramatic decrease in elevated liver enzymes after just 7 days of using SILIPHOS® daily. 18. Vailati A., Aristia L., Sozzè E., Milani F., Inglese V., Galenda P., Bossolo P.A., Ascari E., Lampertico M., Comis S., Marena G., Fitoterapia 64, 219 (1993). 19. Marena C., Lampertico M., Planta Med. 57, suppl., A124 (1991). 20. Buzzelli G., Moscarella S., Giusti A., Duchini A., Marena C., Lampertico M., Int. J. Clin. Pharmacol. Ther. Toxicol. 31, 456 (1993). 21. Moscarella S., Giusti A., Marra F., Marena C., Lampertico M., Relli P., Gentilini P., Buzzelli G., Curr. Ther.Res. 53, 98 (1993).